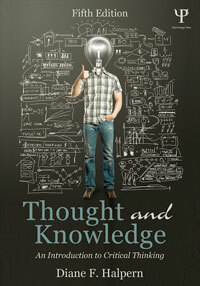 This is the companion website for the 5th Edition of Thought and Knowledge: An Introduction to Critical Thinking. Written by award-winning educator and past president of the APA, Diane Halpern, this thoroughly revised edition applies theory and research from the learning sciences to teach students the thinking skills they need to succeed in today’s world. A rigorous academic grounding based in cognitive psychology helps students meet the challenges of a global neighborhood and make meaningful conclusions from the overwhelming quantity of information now available at the click of a mouse. The skills learned with this text will help students learn more efficiently, research more productively, and present logical, informed arguments.